The road is never straight when you’re walking it. Usually, it feels like you’re cutting your way through an overgrown, unruly bramble. It’s hard to see two feet in front of you, you’re hacking your way through obstacles, and along the way you pick up a few scrapes and scars. Sometimes it even feels like you’re moving backwards, or sideways. And ever so slowly making your way forward. It’s not until you look back, and see where you’ve come from, that you can recognize the path was actually pretty straight. More clear than you realized. And that you’ve come farther than you imagined. From afar, Hannah Mills’ trajectory looks pretty clear. An innate alchemist, she seamlessly transitioned from winemaker to tea maker. But along the way, her journey from winemaker to entrepreneur was been anything but obvious. Hannah has these bright, golden-green eyes. When she speaks, she looks at you with a mixture of curiosity and intrigue and wonder and bemusement. You feel like she’s looking deep into your heart, and you understand instantly that the woman you’re looking at knows her own heart very well. That self-awareness is something that takes time—and fortitude—to cultivate. After spending years mastering the art of winemaking—learning about varietals, spending time in vineyards tending to grapes, making wine for international wineries—she left the industry. Called to do something greater, but not quite sure what that big thing was supposed to be, she found herself immersed in the world of nutrition and wellness. And that exploration, in turn, led her down a road of memory and rediscovery of her Cherokee-Choctaw Native American heritage. And Neakita Organic Goods was born. 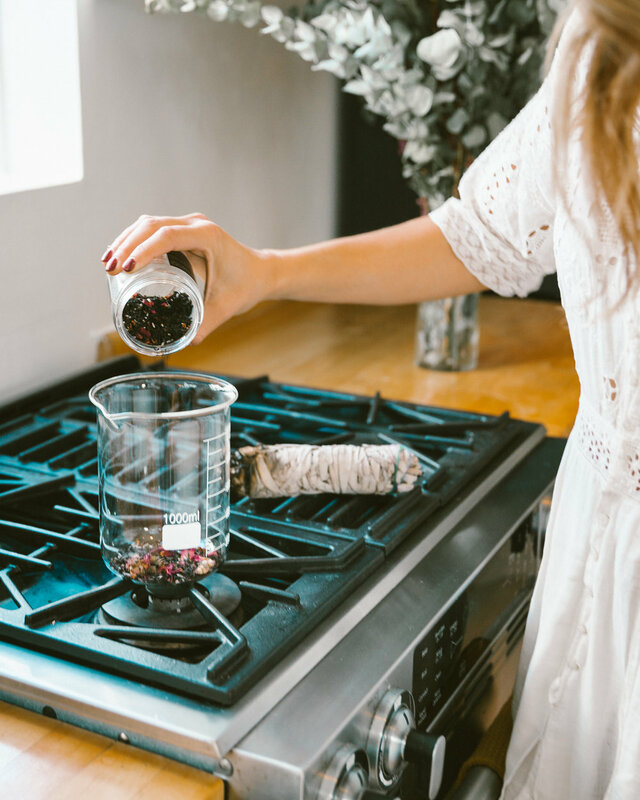 Created out of necessity for a friend dealing with anxiety, Hannah’s first tea blend married her winemaking knowledge, her passion for wellness, and innate understanding of the healing power of plants and herbs. “So much of what Neakita is an expression of my pilgrimage back to my ancestry and, just sharing that journey,” she explains as we sit down on the couch of her Venice home, sipping cups of STRENGTH tea that she’s just poured for us. After that first blend, she knew she had something. And Hannah also saw the potential to bring the wisdom of her ancestry to the masses—to pay homage to her bloodline while bringing awareness around Native American traditions and knowledge. 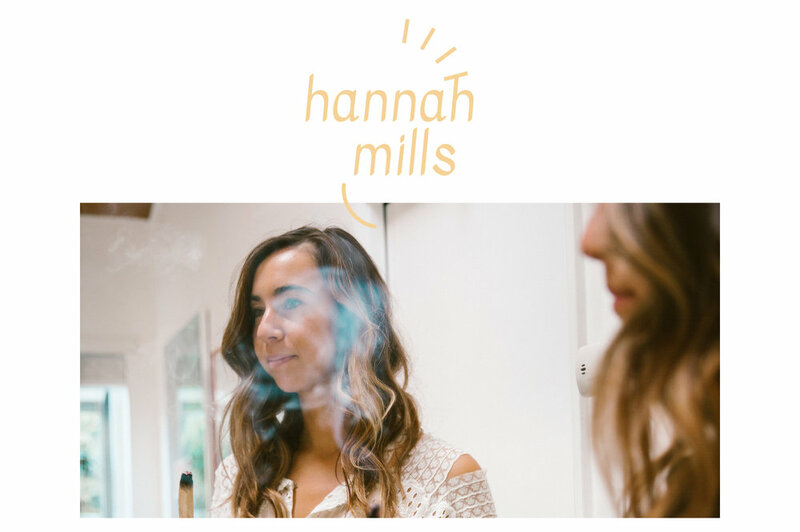 We admire Hannah deeply for so many reasons—she’s crazy-smart, she works damn hard, and she’s single-handedly created an incredible product that you can find in stores and retailers throughout the United States. But it’s her empathy that we admire the most. Her teas help people feel better on a cellular level. Her company’s mission seeks to elevate her ancestry. And when it comes to lifting up other women, Hannah is the first person to offer her hand in help. The more you give, the more you will receive. But not from a place of like, “I’m gonna give to get,” but it’s just, energetically, universally ... it just happens. I think we’re in this really beautiful time where we can just live from our heart, and give from our heart, and do business from our heart, and it can work. Michelle: So, easy stuff first - what does your morning routine look like? Hannah: Hmm, you know, I wish I could say it was the same thing every morning. But it’s not—I think it’s more of a seasonal shift, right? So, like, we eat different foods in different seasons and experiences, and I think the same goes for my morning routine. In times like this, when it’s a bit colder outside, and it’s darker in the morning, I really value that inward moment. Of course with tea, it’s genuinely just the act of making the tea before doing anything in my day. You know, hearing the herbs dropping into the glass, hearing the water boiling coming over, watching the steam rise … noticing all those aspects and just being present with it. And then sitting down with it and having that be my meditation. You know, for so long, I was trying to make it be this other thing of, like, people tell you how you have to meditate or it has to be this way or that way, “twenty minutes of silence” or blah blah blah. And I’ve really found that having a mediation through the means of tea has been the most effective for me and the most meaningful. And as I’ve been getting more connected to my ancestral roots—I’m Native American—I’ve been trying to pay respect to the four directions. I’ll do a prayer to call in support from the ancestors. I can’t say that I do it every day, but I will say that whenever I’m having creative blocks and I’m feeling challenged or frustrated or I’m really, like, seeking guidance, I find that it’s something that has been very, very nourishing to me. Just studying and reading and feeling intuitively. 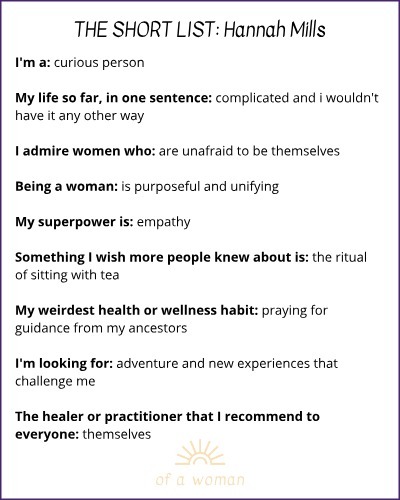 My cousin has also taught me a lot—she got her Masters degree in Spiritual Psychology, and her focus has been ancestral trauma and ancestral healing. So she and I have been talking a lot about this journey together. You can digest all of this information, but for the most part it’s kind of surrendering and just listening, and feeling, and intuitively getting it, and feeling connection. And I started to see the results of these practices in my life in all these different ways of like, “Oh my gosh, all of a sudden this just came to me,” or “All of a sudden, this person just happened...” You know? I’ve found that that’s been a really beautiful journey, and I’m still very much on it. I’m still discovering it, but it’s a really exciting journey to be on. It feels like I have a lot of support—you know, Universal support—when I do that. So yeah, lately, that’s been my morning! But sometimes, you know, I’m more get-up-and-jump-out-the-door person. I hop on my bicycle and go to a coffee shop and start working because that’s when I can be my most productive and inspired and clear-minded, as well. So, just kind of depends. Having the flexibility to be “Yeah, I’m not married to any routine, I’m going to really listen to what I need,” is empowering. Totally. You know, some days you’re like, “I just want to go to a restorative yoga class,” and sometimes you’re like, “I want to go on a run and just get all the energy out!” I think...I find that to be similar with my morning routine, too. Sometimes I just gotta get up and go. And sometimes my morning routine is actually evening instead, and I do a bath, and take that time in the evening instead. So, it always happens at some point, but I can’t say it’s always in the morning. Tell us more about the tea ceremonies. I think that most people don’t really understand what a tea ceremony is. Like, “I feel like I’m just going to go drink tea quietly”... which isn’t exactly right. So, what does it look like? My interpretation of it is that you’re taking a moment with yourself and pausing and receiving. I’m there as the facilitator of the ceremony to provide this experience and this medicine. And, yes, it’s a group of people you haven’t met before, but we’re all syncing our breath, and we’re all connecting with each other. It is silent, yet there’s so much happening—hearing the sounds, the experience of being served, and feeling the energy amongst one another. It’s unifying. Then, after going through a round of being served, I typically ask for people to share, you know, what’s been coming up for them or anything that they want to share or feel called to share with the group. And it’s always really profound to see, you know, and a lot of times the feedback is something along the lines of “I’ve never felt this comfortable in a room full of strangers before.” Every time, there’s someone who cries, and usually it’s a beautiful type of tear that’s just, like, “Wow, I was really able to forgive this person” or “I can feel this sense of love and compassion for myself” or “I’ve been so hard on myself.” And, for other people, it’s just peaceful; it doesn’t have to be some sort of deep, meaningful “Aha!” but it’s also just kind of, like, taking a moment. That’s it, I guess. You allow the herbs to work on the body and be the medicine that it is, and having the breathwork and the meditation and the conversation be something that really fulfills you on both an emotional and spiritual level as well. When you’re making the teas, you’re very thoughtful about the herbs that you combine. How do you learn about them and have an intention for each blend? Yeah, well, I was a winemaker, so the whole art of balance and structure and flavors is something that I’ve spent a lot of time refining. 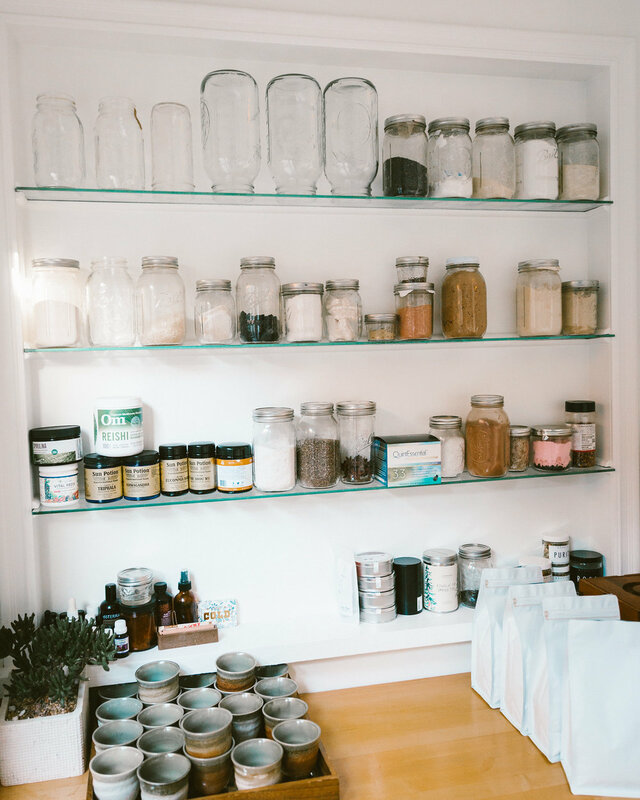 And then, in terms of herbs, I went back to school for holistic nutrition and studied that, so I dove into a lot of that—understanding what herbs can do for our bodies. I always start with what I want it to evoke for people. So, for instance, Freedom is a stress-relieving tea, and it was actually the first blend that I made. It was for a friend of mine who really struggled with anxiety. First it was, “OK, what herbs can fulfill this? What herbs can make you feel this sense of calm?” That’s why I call it Freedom, because when you’re in that moment of anxiety or panic or extreme stress, it feels very suffocating, right? And, then after the herbs are selected for their healing properties, you have to think, “Okay, well then, bringing in the whole art of it—how do these interact with each other on flavor and balance-wise?” Yes, I want it to nourish your body, and I want it to be this sensorial experience that’s very enjoyable and pleasurable. So it’s kind of, like, going back and forth between those things and doing blending trials, and feeling it, and meditating with it, and calling in for support, you know? And then, when it feels right, it feels right. How much of your ancestry do you bring into your tea making? I’m so curious about this. Do you ever find that you’ll make a blend and then you look back, and you realize that’s perhaps a recipe or form of medicine that’s been passed down through your lineage? That’s a great question. Yeah, I do think that that happens. I’m launching a new collection of teas called “The Directions Collection,” and it’s based on the Native American medicine wheel. That has been definitely such an exciting and beautiful journey personally. And that’s so much of what Neakita is: an expression of my pilgrimage back to my ancestry and just sharing that journey. I do a prayer to the four directions [before blending the teas] and I definitely feel like I receive messaging, you know. I ask for support and then I will get this overwhelming like, *snaps fingers*. It’s just like “YES, that is it, that is what it’s supposed to be,” and that’s how it is. That’s amazing. Is the prayer specific to your lineage? With the directions prayer, it’s very open to how you feel intuitively. Different tribes have different interpretations of it. So whether you’re speaking to the Choctaw or the Cherokee or the Navajo or, like, any tribe, they’re going to have a different way of speaking about [connecting to ancestors and interpreting messages]. And, yes, there is a commonality of course, a unification. But, like, there’s also different ways to approach it. I remember talking to my cousin about it, and I was like, “I don’t understand. If there’s these different interpretations, then what is the truth? What’s the real answer?” And her advice was to just come back to myself, come back to myself, be in the space, and do what feels right for you. And I think that’s with anything, right? We’re taking these ancient or ancestral teachings and bringing them into modern-day living, and it’s not going to be the same, you know—we’re not in the same world. We’re not in the same environment. So I think it’s about being influenced and paying respect, but also doing what’s right for the now. There’s so much wisdom and knowledge just within. It’s within our lineage, it’s within our history. We were born with it, it’s there. Just going on a walk and seeing the signs—it’s everywhere, all the time. When you work for yourself, your productivity ebbs and flows drastically. Do you ever have days when you’re like, “Nope! No work is going to get done today”? Hmm. That’s a good question because that’s something that I’ve definitely been on a journey with as well. Sometimes, it’s an emotional day, right? Or a challenging day. I don’t think it’s about, like, “I’m not going to do anything today,” but it is about listening to that and giving myself the morning or sleeping in or doing whatever needs to be done. Before, when I wasn’t doing that and I would push through it, then what would end up happening is I would just waste time, right? Because I’m not being productive, I’m not being efficient. I’m zoning off on something like Instagram or whatever, and trying to escape because I’m not allowing myself to truly replenish. By pressing the pause and just doing what I need to do, like, “Okay, I have an hour. Do whatever needs to be done.” I find that that’s the most effective, and then I can dive back in. So, yeah, I’m definitely still learning to give myself permission to do that, but 100% I can say it’s always more effective when I press the pause button. And the cool thing is, once you do it, it really doesn't need to be a whole day. Like, really, if you give yourself a dedicated “no technology,” whether it’s a walk or time with yourself for an hour, you can pretty much get back in the saddle. Is that a hard idea for you as a business owner to get used to? Because you’re doing a lot! Tell me about your work right now, what it looks like. *laughs* Yeah, um, so, just, like, where do you begin? It’s just, like, all the things! All the things! I mean, I’m the one who makes the tea, genuinely fulfilling everything and sourcing and finding all the ingredients. And making sure that inventory is where it needs to be to fulfill all my orders. I also design everything for my brand, so whether that’s like designing new labels or creating assets for emails, I do all of it. I still hand-label everything, I still hand-blend everything, like, every single thing that happens is done by hand. So all of that, and doing the social media for Neakita, you know. But, I’ve given myself some more permission in that. Before, I kind of put this pressure of like, “Oh, I have to post every day,” and I’ve really kind of relinquished that. Now, I’ll post when I have something to say. And if that doesn’t positively impact the algorithm, who cares? I just need it to be genuine, because that’s the only way it can be done sustainably and meaningfully. I’m experiencing these growing pains where, you know, I’m realizing I can’t do it all alone. And I think that that’s a big lesson that I’m still growing into—being okay with not being able to do it all myself. So, I’m chatting with a woman right now who I’m very excited about to potentially come on to help me with some of the sourcing, to be able to take Neakita to the next level of being able to have the bandwidth to create the relationships with the farmers. I really want to show people what the farmers are doing, give them a voice, and share their stories. I see the bigger vision of what it is, because it’s not just about tea, it’s about who grew the herbs; it’s the whole journey of getting it to the cup. I want to do that, but I can’t do all of those things until I allow help to come in. Do you still supplement your income by balancing other work on top of Neakita? Yeah! I have clients who I do the social media strategy for. It’s great and I’m happy to do that. It’s a really good fit. But, with that being said, it’s still a balancing act of, juggling all the things I have going on and also doing someone else’s work which is… I have the mindset where I would rather continue working on the side for awhile and not take any money out of Neakita and be able to give that money to someone like this woman I’m speaking with, who can come on and really support the business. And I’m okay with that. I want to do it in the sustainable, slow process to make sure that it’s done right. And I think that means that I’ll have to have, you know, income coming in on the side for awhile. But who knows? Who knows how long! But, for now, that’s where I’m at. I feel like the last time I talked to you, you were in a really different place, and that wasn’t that long ago—maybe three months? Yeah, it’s true, it’s kind of like seeing the business making the shifts. You know, for a while I was saying, “I’m constantly putting money into this,” and now, seeing it actually taking care of itself. I don’t need a penny, but at least it’s taking care of itself, which is really exciting. There’s more orders than I could have imagined when we spoke last, so things are going really well. But on my end, it’s making sure that I continue the process gracefully so I maintain integrity with everyone. I’m so proud of you, that’s amazing. Yeah, it’s exciting. I definitely have, like, “pinch me” moments all the time. It feels like, “Wow, this thing is really happening!” because it feels like such a contribution for people, especially when I’m in the tea ceremonies. It gives me goosebumps just thinking about being a part of that moment where people take the time themselves and connect and hear themselves again. We all just run around like chickens with our heads cut off these days, and we don’t take that time. Then all of a sudden, we can feel all the feelings, and we can process, and we can have these beautiful realizations. I love how thoughtful you are about what you’re creating and how it impacts others. You’re a true leader, because you aren’t just thinking about your brand or your company, but you really are thoughtful about who your product affects. Do you have the greater impact of Neakita on a day-to-day basis? Totally, that is my “why,” 100%. It’s literally the thing that gets me out of bed every morning, and keeps me up late doing what I’m doing, and has me maintaining a sense of energy and excitement with it. That’s what it’s all about. I’m building a brand to be a platform to give people a voice, you know? The farmers, and the indigenous peoples, and not just necessarily Native Americans, although that’s who’s nearest and dearest to my heart. I think the best way to reinstate a sense of respect and honor is by sharing the teachings and doing it in a way that pays reverence. That’s definitely the biggest “why.” It’s a really personal mission to me. These teachings and this way of life was taken from us. My grandfather was the generation of Native American kids who were taken unwillingly and put into the American boarding school. Their culture was essentially beaten out of them: they weren’t allowed to practice any of their traditions, the family wasn’t allowed to visit them, they weren’t allowed to speak the language. And those schools were successful. He was abused, and as a result, he abused others. And then there’s alcoholism, and drug addiction, and all these means to cope because they no longer have their tradition anymore. They no longer have what roots them anymore. And that unrooted feeling gets passed to the next and the next generations. I grew up going to pow-wows every once in awhile, but really, the culture isn’t there anymore. And it’s not anyone’s fault that it’s not there anymore. But I feel this deep calling to rediscover it. And I’m not the only one that’s gone through that experience. There are so many indigenous peoples or cultures who have experienced that same loss of tradition, right? I just feel it everywhere in my whole body, that this is what I’m supposed to do. It’s hard to talk about something before doing it because I’m not in that phase yet to be able to give it the resource that it deserves, but every day I’m getting closer and closer and I’m so excited for that day. What’s a personal quality that you think makes you a really good leader? Hm. That’s funny, when you asked “What’s your superpower?” I had a hard time coming up with an answer on my own because like, I don’t know, I’m just me! My boyfriend was like, “I know what it is!” and I was like, “What? !” and he said “It’s your empathy.” So, I guess that, you know, when he said that, it felt right. But it’s interesting because your strength can also double as your weakness. I remember growing up with that as a young kid, like, coming home and, like, crying from school because I would just feel things all the time, like, everything impacted me so much. I can just feel all of my emotions, all the time. I had to learn how to deal with that. But now, I guess my empathy is something that’s led me to this journey; feeling the pain and feeling the beauty in everything. I guess that would be my strength. What’s the biggest thing that you’ve learned about being a female leader? It could be through Neakita but also through your professional experience. I think the two most important things when leading people are living what you’re preaching with your actions, so being the example 100%. I’ve worked on teams where I see the CEO showing up every day as a leader. They’re in the office before everyone else, they’re there after, and they’re doing it with a smile on their face, and they’re passionate, and they care, and they’re lit up. Then, all of a sudden, that passion and that commitment is infectious. You’re like, “Oh my gosh, you’re all in? Wait, you’re even more than all in? OK, then I guess I want to be all in, too.” It’s, like, it’s an infectious energy to be a part of. As the boss, you’ve got to keep it fun and you’ve got to keep that excitement alive. Because that’s why we’re doing what we’re doing. You spend a lot of time doing your work, so it should be something that, like, genuinely GENUINELY lights you up and really has purpose. If it doesn’t have purpose for you, then it’s not the right fit, you know? The second would be to make sure that everybody that you interact with knows that you have their back and that your main priority is them. Especially for people on your team. I think that those are the two things that come to mind of really important: genuinely being the example and making sure that everybody that you’re working with knows that you have their back. I think it’s massively important to be passionate about what you’re doing. Or else, why even bother? Thank God you had that. Yeah! It was an emotional moment, too, because it estranged me from a lot of people in my life. Now, with perspective, it seems kind of, like, “Why? It’s not a big deal.” But, in the moment, I think it was just really isolating because you’re really pivoting and people are like, “Huh? You’re supposed to be in this box, and you’re not in that box anymore, so who are you?” But it’s that path of self discovery. And then when you get to the other side, people are like, “Oh, okay, I get it. That’s who you are, that’s what you’re doing, it’s all good.” But, I think it’s that piece in there that... I have a lot of compassion for people who go through that, because it’s not easy to say “This isn’t right,” and to do something else. It’s quite scary. Yeah. After all the years, and all the money, all the expectation. But, I think we are very blessed to be in a community here [in Los Angeles] where it seems everybody is doing their thing. What’s something that you mastered this year or that you learned, being in this new space? Ohh… okay. So, what comes to mind is I finally have understood and kind of… but I can truly learn to do anything. I’m getting comfortable being uncomfortable. Like, yeah, I’m gonna be uncomfortable. My business is growing, and I’m growing up, and I have to learn new things. Exactly. Yeah, and I think that that’s an important piece to pay respect to, too. Like, I’m 100% in this space doing what I’m doing because of the support that family and friends have given me along the way. Because I’ve had so many of those moments where I’m like, “Hey, I don’t know how to do this,” and then a friend or someone in my family is like, “I got you! I’ll show you how,” and then you know how. So definitely, it takes a village to make anything happen. I definitely want to pay respect there, because it’s deserved. And then because I’ve been supported so much, of course I want to pay it forward. When someone asks me a question, it’s like, “Yeah! Totally, I can help with that! Why not?” You know? I think that that’s such a refreshing reality, and maybe that’s the lesson, too. The more you give, the more you will receive, but, like, not from a place of like, “I’m gonna give to get,” but it’s just, like, energetically, universally, like, it just happens. I think we’re in this really beautiful time where we can just live from our heart, and give from our heart, and do business from our heart, and it can work. I think we’re all here to show that it’s possible to live from your heart.